Kristoff's Sumatra cigars are one of the boutique cigar manufacturer's most popular blends for a reason. Handmade in the Dominican Republic, the cigar's rich Ecuadorian Sumatra wrapper envelopes a specially aged blend of Cuban seed Dominican and Nicaraguan fillers and a tasty Brazilian binder. The Kristoff Sumatra's complex, medium-bodied blend offers a flavorful smoking experience with notes of spice, cinnamon, cedar, and a smooth sweet finish. 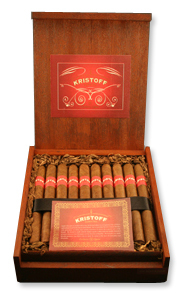 The Kristoff Sumatra is packaged in a rugged, rough-cut cedar box of 20 cigars surrounded by loose tobacco.